Large waves crashing onto a shore bring a tremendous amount of energy that has a significant eroding effect, and several unique erosion features commonly form on rocky shores with strong waves. When waves approach an irregular shore, they are slowed down to varying degrees, depending on differences in the water depth, and as they slow, they are bent or refracted. In Figure 17.11, wave energy is represented by the red arrows. That energy is evenly spaced out in the deep water, but because of refraction, the energy of the waves — which moves perpendicular to the wave crests — is being focused on the headlands (Frank Island and Cox Point in this case). 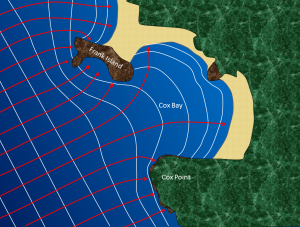 On irregular coasts, the headlands receive much more wave energy than the intervening bays, and thus they are more strongly eroded. The result of this is coastal straightening. An irregular coast, like the west coast of Vancouver Island, will eventually become straightened, although that process will take millions of years. Wave erosion is greatest in the surf zone, where the wave base is impinging strongly on the sea floor and where the waves are breaking. 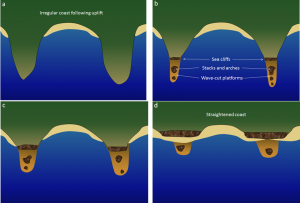 The result is that the substrate in the surf zone is typically eroded to a flat surface known as a wave-cut platform (or wave-cut terrace) (Figure 17.12). 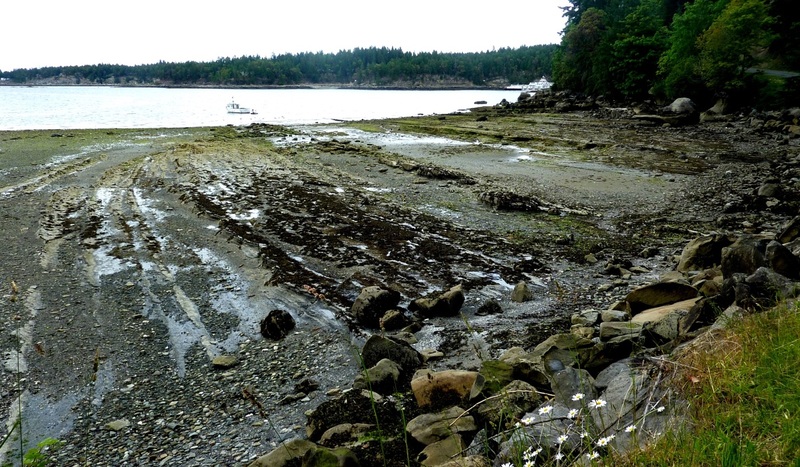 A wave-cut platform extends across the intertidal zone. Relatively resistant rock that does not get completely eroded during the formation of a wave-cut platform will remain behind to form a stack. 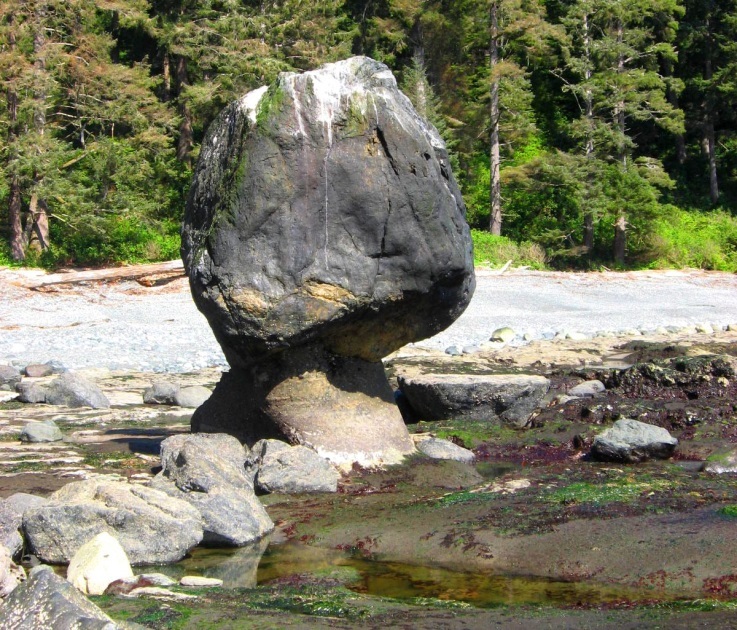 An example from the Juan de Fuca Trail of southwestern Vancouver Island is shown in Figure 17.13. Here the different layers of the sedimentary rock have different resistance to erosion. The upper part of this stack is made up of rock that resisted erosion, and that rock has protected a small pedestal of underlying softer rock. The softer rock will eventually be eroded and the big rock will become just another boulder on the beach. Arches and sea caves are related to stacks because they all form as a result of the erosion of relatively non-resistant rock. 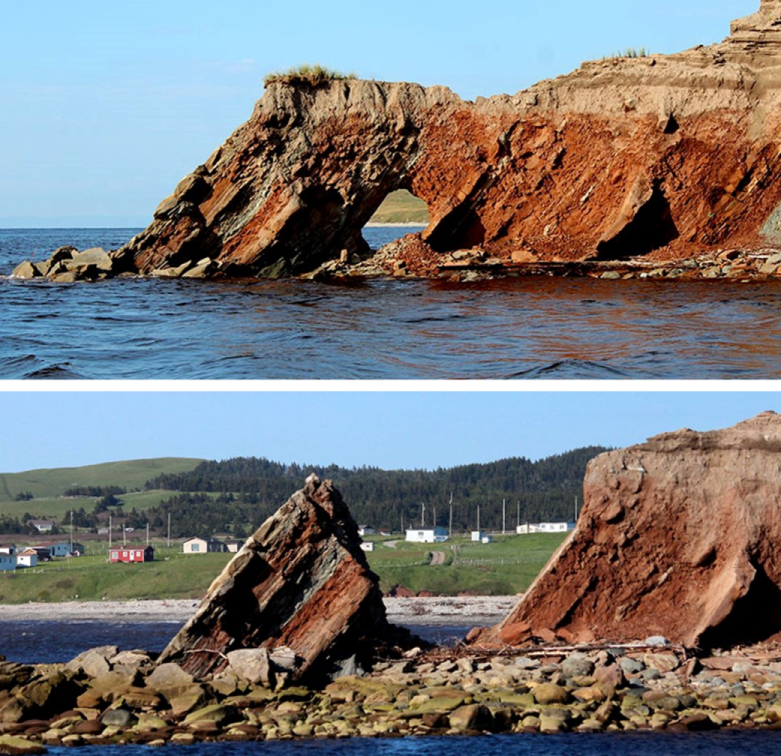 An arch in the Barachois River area of western Newfoundland is shown in Figure 17.14. This feature started out as a sea cave, and then, after being eroded from both sides, became an arch. 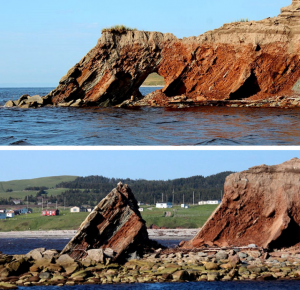 During the winter of 2012/2013, the arch collapsed, leaving a small stack at the end of the point. If you look carefully at the upper photograph you can see that the hole that makes the arch developed within a layer of relatively soft and weak rock. 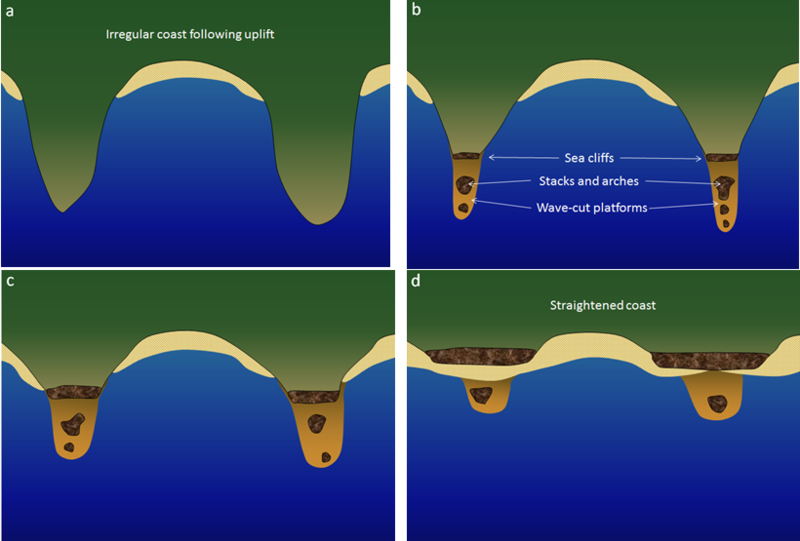 Figure 17.15 summarizes the process of transformation of an irregular coast, initially produced by tectonic uplift, into a straightened coast with sea cliffs (wave-eroded escarpments) and the remnants of stacks, arches, and wave-cut platforms. The next stages of this process would be the continued landward erosion of the sea cliffs and the complete erosion of the stacks and wave-cut platforms in favour of a continuous and nearly straight sandy beach. 17.2 Landforms of Coastal Erosion by Steven Earle is licensed under a Creative Commons Attribution 4.0 International License, except where otherwise noted.